Song written by Kate Bush in the first half of the Seventies and it became one of the songs performed by the KT Bush Band during their performances in the pub circuit in 1977. Brian Bath, member of the band, recalled later: " Rob got a dry ice machine from somewhere. We used that on stage for 'James And The Cold Gun' and it looked great. We had a bit of a show going! Kate did a costume change, she'd put on a bloomin' Western cowgirl dress for the second set! The theatrical thing was starting to get there." Del Palmer recalled: "She was just brilliant, she used to wear this big long white robe with coloured ribbons on or a long black dress with big flowers in her hair. She did the whole thing with the gun and [the audience] just loved it. She'd go around shooting people." The song was recorded in the studio in 1977 and released on her debut album The Kick Inside. When she embarked on the Tour of Life in 1979, the live performance of 'James And The Cold Gun' used and enhanced elements of those original performances from 1977. There are three officially released versions of the song: the album version and a live version, recorded at the Hammersmith Odeon in 1979, during one of the shows of the Tour of Life. An edited version of this live version was included in the On Stage EP. 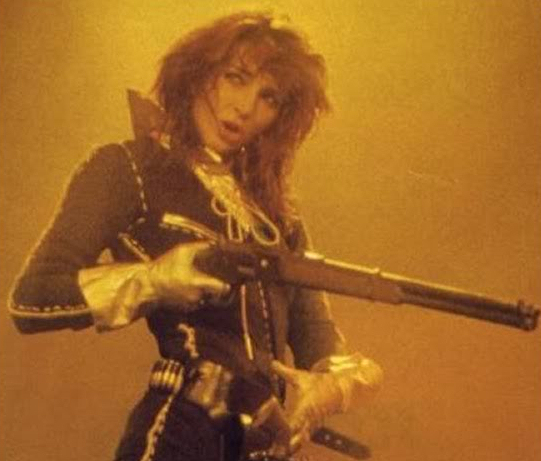 'James And The Cold Gun' was covered by Ariel and The Hounds Of Love.